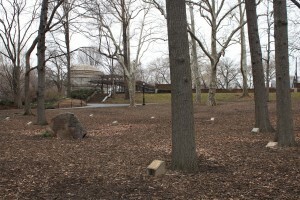 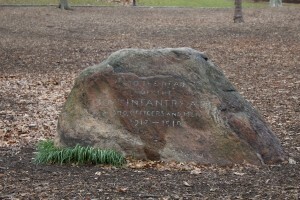 New York honors a World War I infantry regiment with a memorial grove in Central Park. 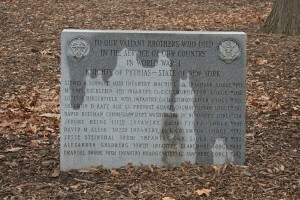 The 307th Infantry Memorial Grove, not far from the park’s band shell and the 7th Regiment Civil War monument, honors regimental members killed in the war. 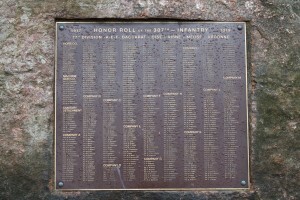 The monument’s north face displays a plaque listing more than 560 names as well as battles in which the regiment fought. The plaque is a replacement for the original. 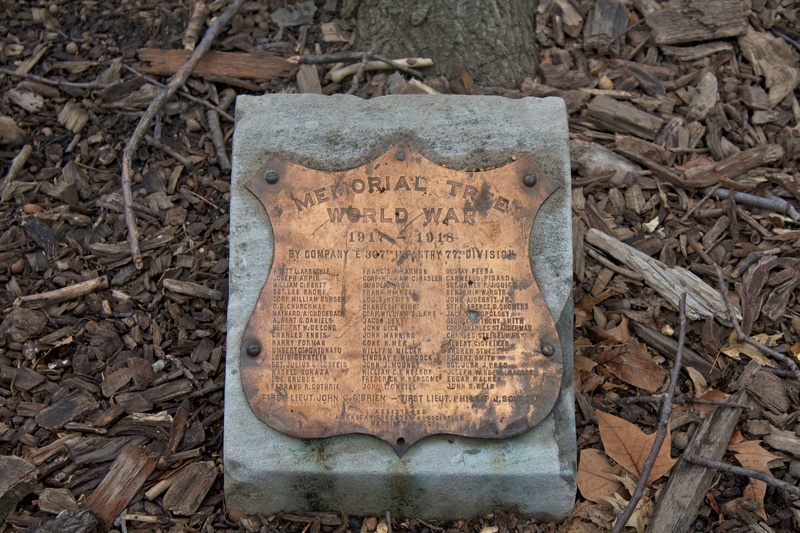 The grove, dedicated in 1925, also has a number of trees with markers near their bases that list members of specific companies. 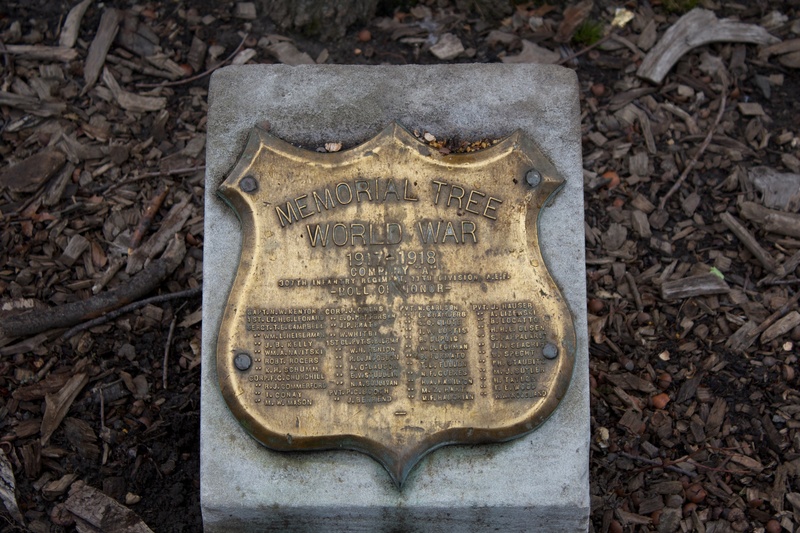 Not every marker has a tree, perhaps reflecting the difficulty of maintaining a memorial grove more than 85 years after its dedication. 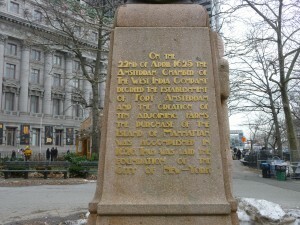 The A.E.F. 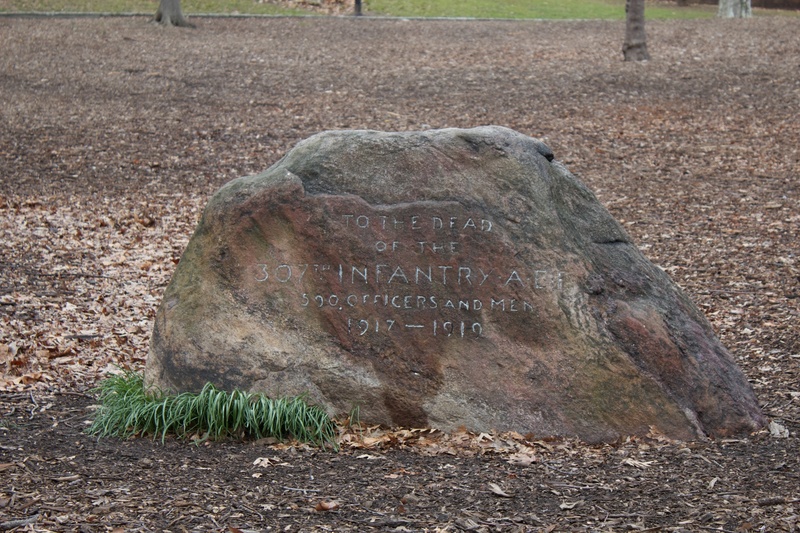 on the boulder’s inscription refers to the American Expeditionary Forces, U.S. troops who fought with British and French troops against the German military. 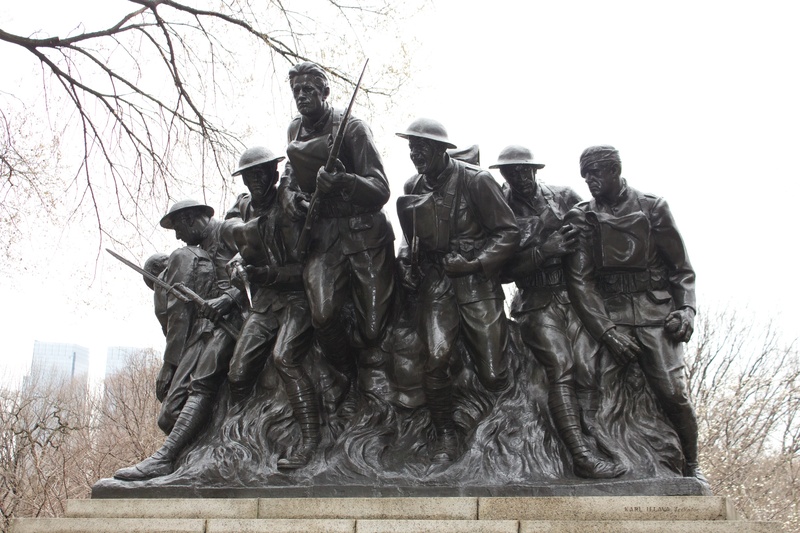 One of the 307th’s major campaigns was the Meuse-Argonne offensive along the Western Front in 1918. 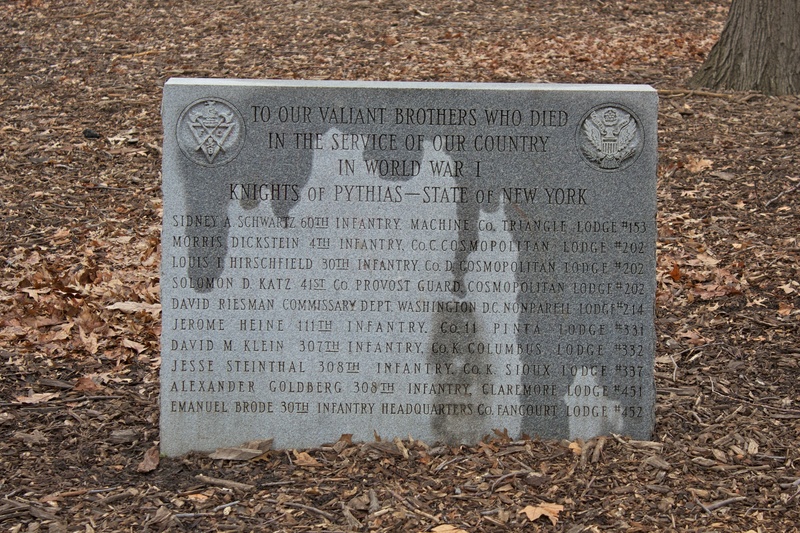 The grove also has an undated granite marker honoring members of the fraternal organization Knights of Pythias killed in the First World War. 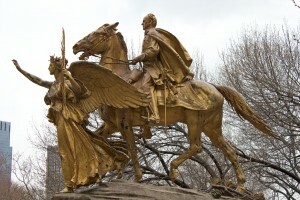 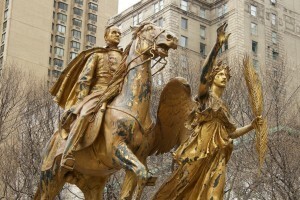 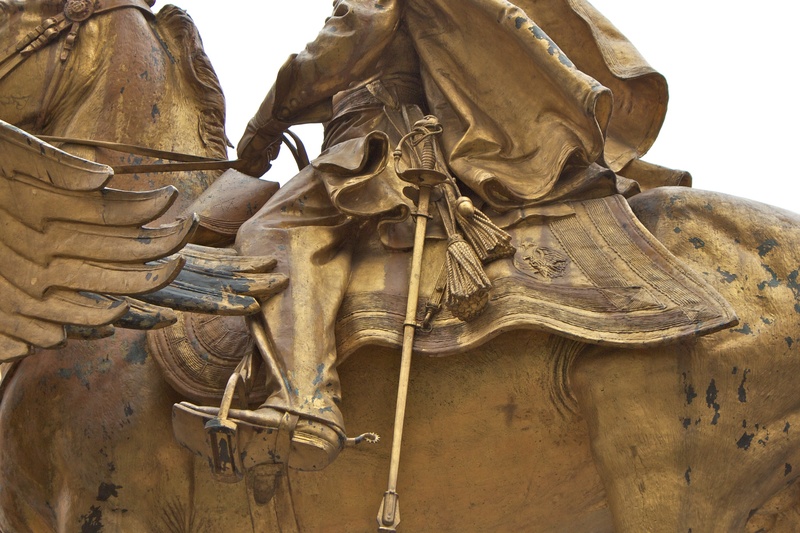 New York honors Union General William Tecumseh Sherman with a Saint-Gaudens statue at an entrance to Central Park. The Sherman statue, at the park southeast entrance at Fifth Avenue and West 59 Street, was the last major work by noted sculptor Augustus Saint-Gaudens. The monument, dedicated in 1903, depicts the general atop his horse being led by Nike, the goddess of victory. 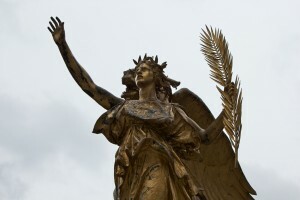 Nike holds a palm branch, representing peace, aloft in her left hand. 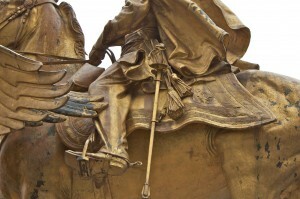 Pine branches and needles near the horse’s rear hooves represent Sherman’s Civil War march through Georgia and the Carolinas. 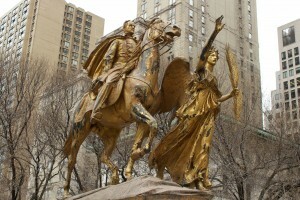 Along with the incredible detail, the statue is notable for its gold leaf covering. 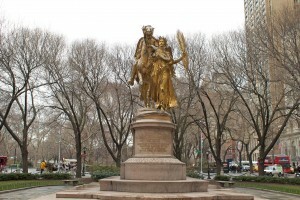 The gold leaf, which has worn off in several places, was reapplied during a 1989 restoration of the monument and the nearby Pulitzer Fountain. 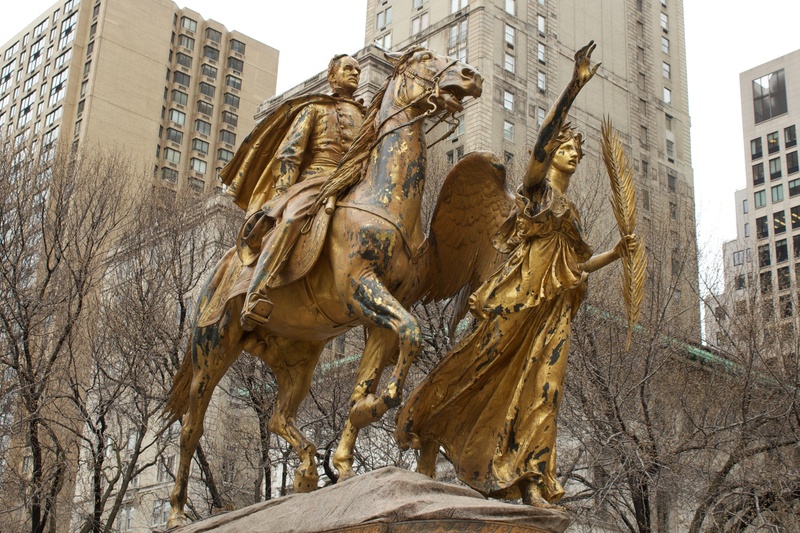 Immediately after the restoration, the monument was a bright gold, and almost painful to look at on sunny days. 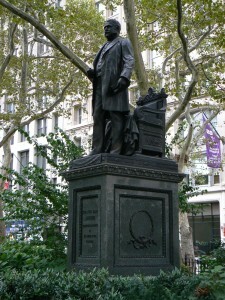 Sherman, an Ohio native, lived in New York after his retirement from the military. The general and Saint-Gaudens met several times before Sherman’s death, with the general posing and sharing war stories with the sculptor. 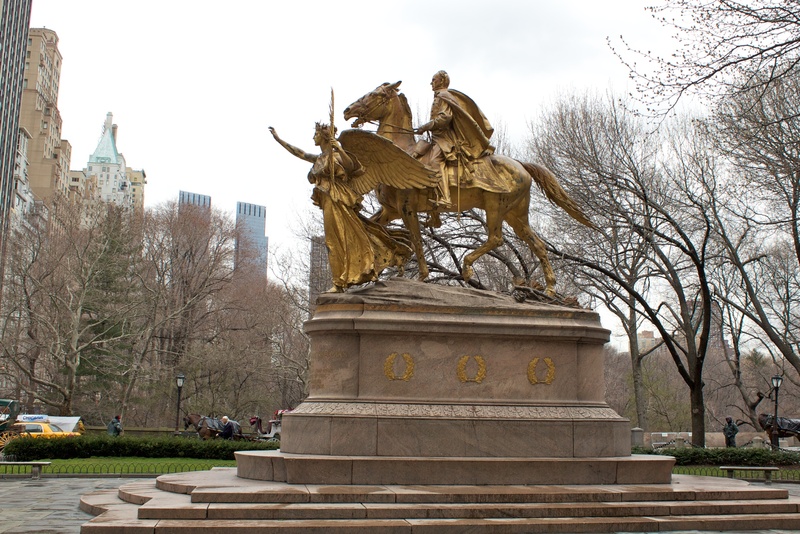 Saint-Gaudens had hoped to place the monument near U.S. Grant’s tomb, but objections from both generals’ families led to the consideration of other sites before the Central Park location was selected. 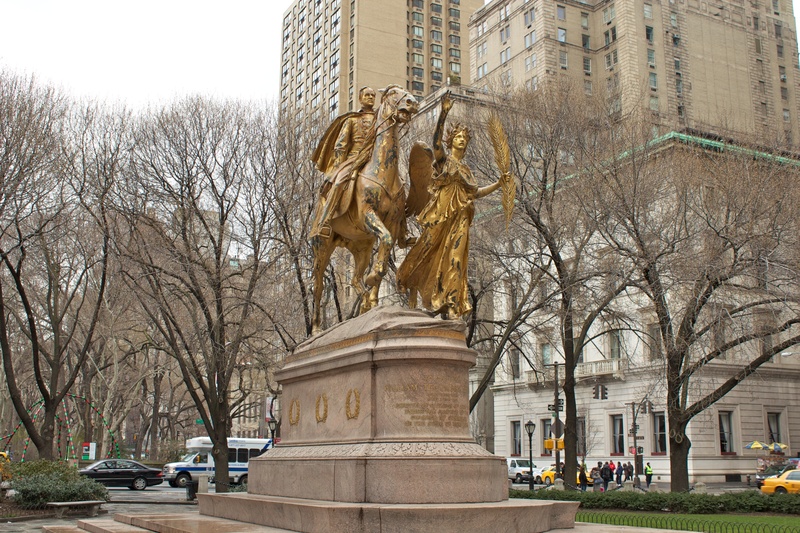 Manhattan’s Grand Army Plaza is one of two in New York, with the other being near Brooklyn’s Prospect Park. 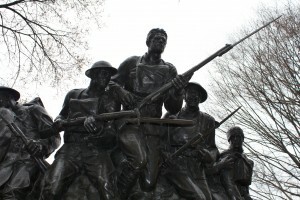 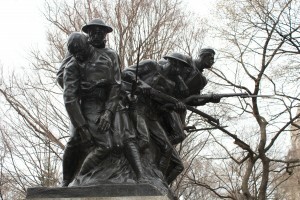 The World War I service of New York’s 107th infantry regiment is honored with a large bronze sculpture in Central Park. The 107th Regiment Monument, dedicated in 1927, features seven soldiers, in a variety of poses, on a large granite base. Three soldiers in the middle are charging, the soldier on the far right (as you face the monument) is preparing to throw hand grenades, and the second soldier from the left is supporting a badly wounded comrade. 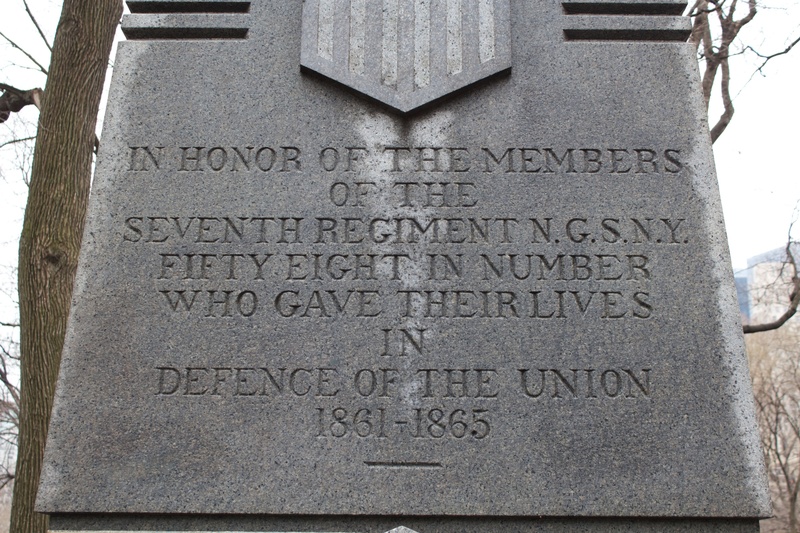 The “Seventh Regiment” description on the base refers to the unit’s designation while it served in the New York National Guard. 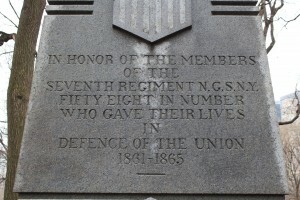 The unit, which traces its roots to 1806, was combined with other regiments and designated as the 107th during World War I. 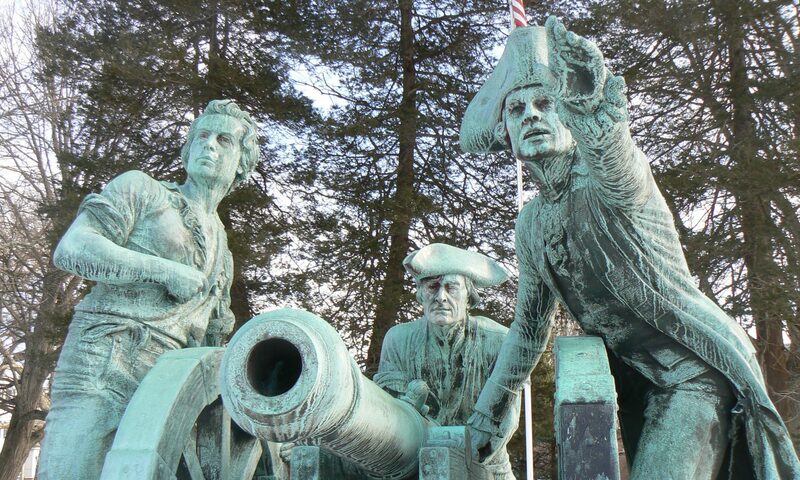 As active fighting began, the regiment had nearly 3,000 officers and men. 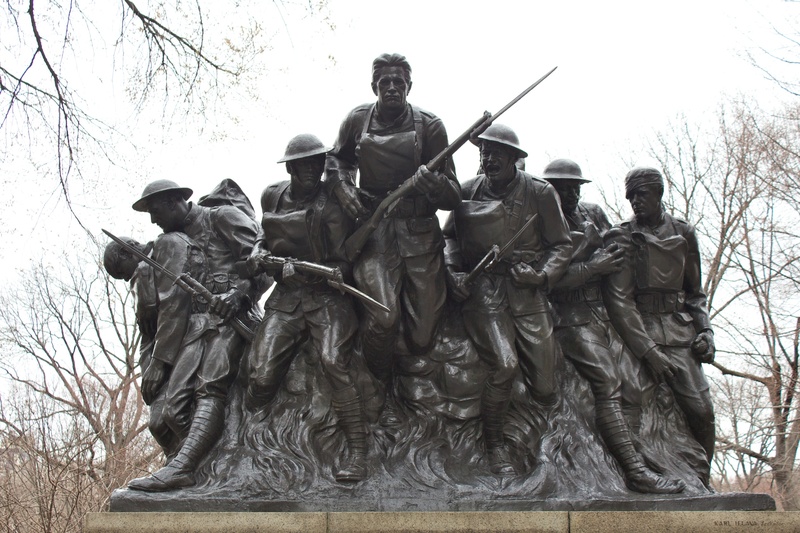 During the war, the unit suffered 1,918 casualties (1,383 wounded, 437 killed and 98 who later died from wounds). The unit’s Civil War service is honored with a monument on the west side of Central Park. 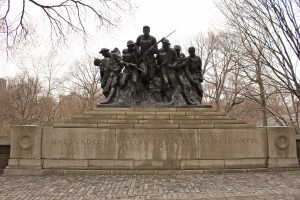 The monument was designed by sculptor Karl Morningstar Illava, who had served as a sergeant in the unit during World War I. 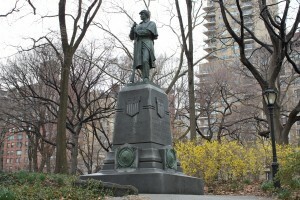 The monument stands along the Fifth Avenue edge of the park at East 67th Street. 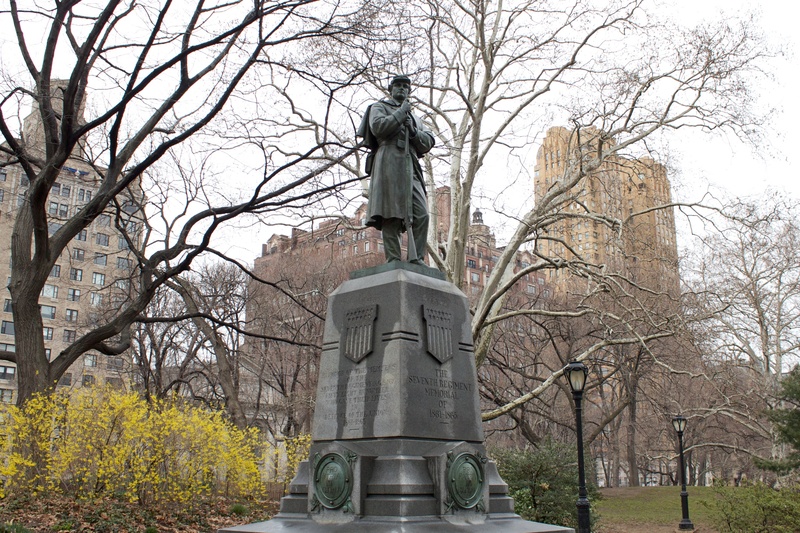 New York honors the Civil War service of a notable National Guard Unit with a monument in Central Park. The west face reads, “Erected by the Seventh Regiment National Guards S.N.Y., MDCCCLXXIII” (1873). 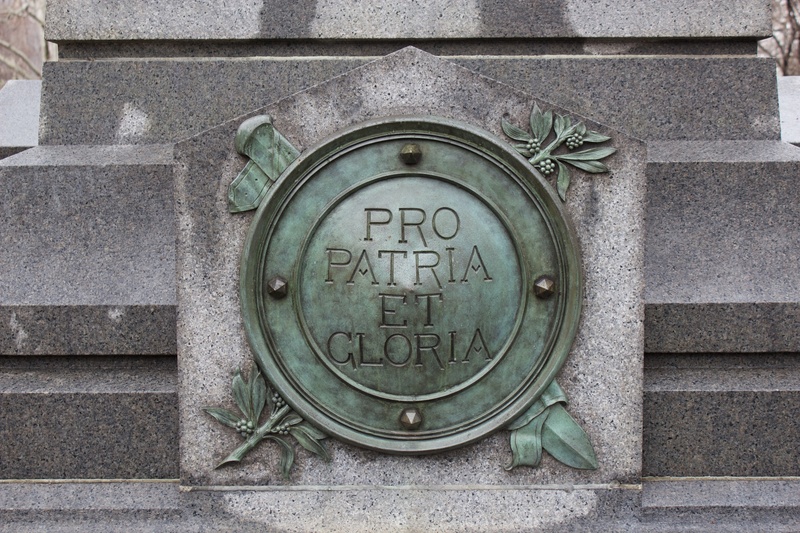 The four sides of the monument’s base also feature bronze trophies inscribed with the regiment’s motto, the Latin phrase “pro patria et gloria” (for country and glory). 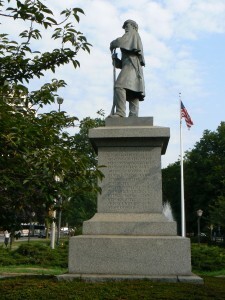 The monument stands in its original location near the park’s West Loop, not far from the band shell. 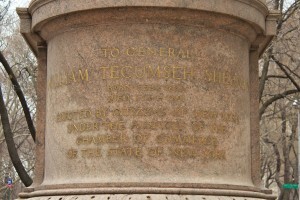 The regiment traces its roots to 1806, when it was organized as a militia unit. 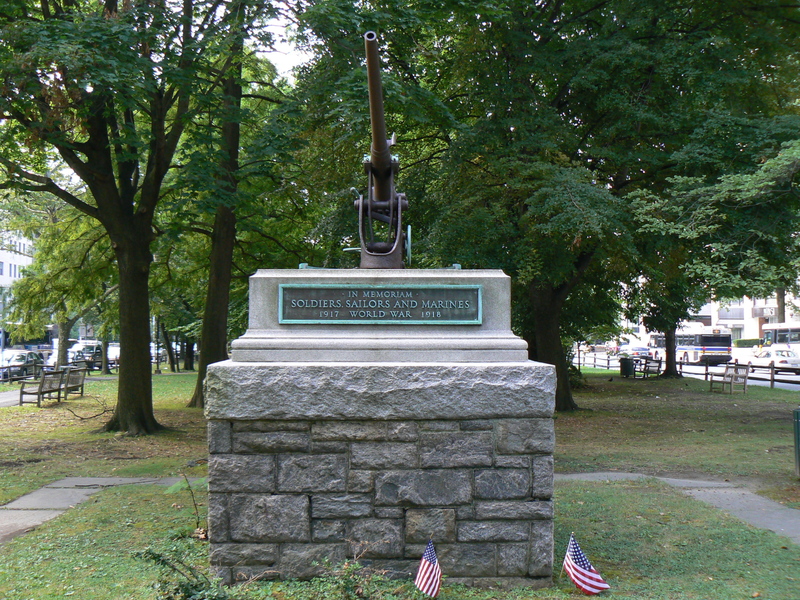 After protecting New York harbor during the War of 1812 and suppressing a number of local riots, the unit served in the Civil War and both World Wars. 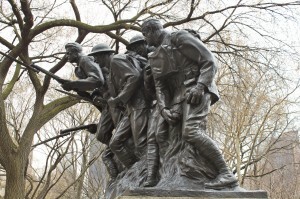 The 7th Regiment was renamed the 107th during World War I, and its service during that conflict is honored with a monument on Fifth Avenue and East 67 Street. The unit’s Civil War monument was created by sculptor John Quincy Adams Ward, whose other works include the statue of Roscoe Conkling in New York’s Madison Square Park. In the stereo image titled, “A View of Central Park,” the gentleman wearing an apron and holding a large mallet may be Ward. 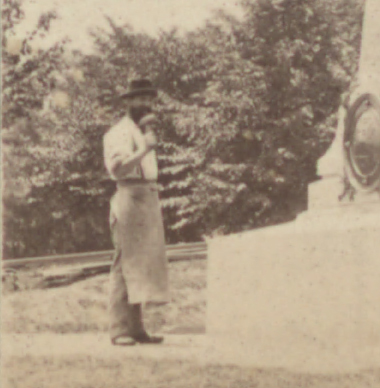 He is not identified in the image, but both Ward and this person had generous beards, and Ward probably wore an apron and used a large mallet at least part of the time. 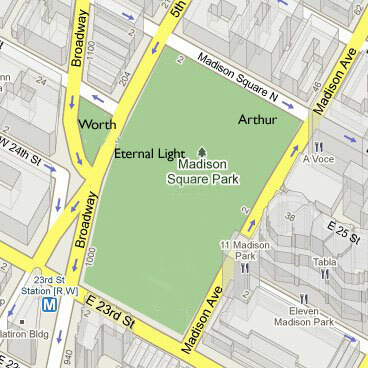 The image also provides an interesting view of how Central Park West has changed since the monument’s dedication. 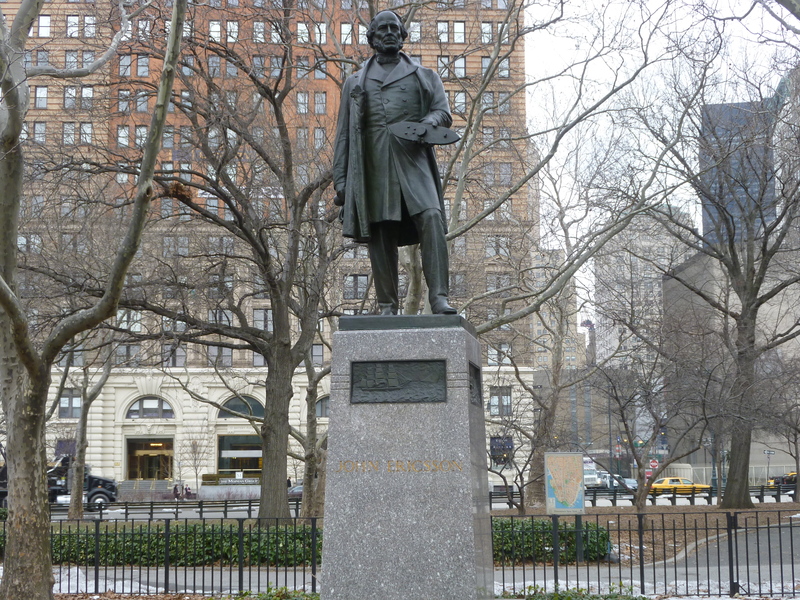 John Ericsson Memorial, New York, N.Y. 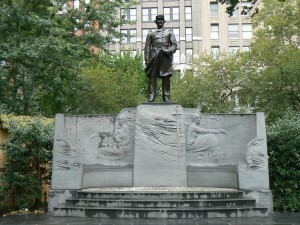 The designer of the Civil War ironclad ship the Monitor is honored with a statue in New York City’s Battery Park. 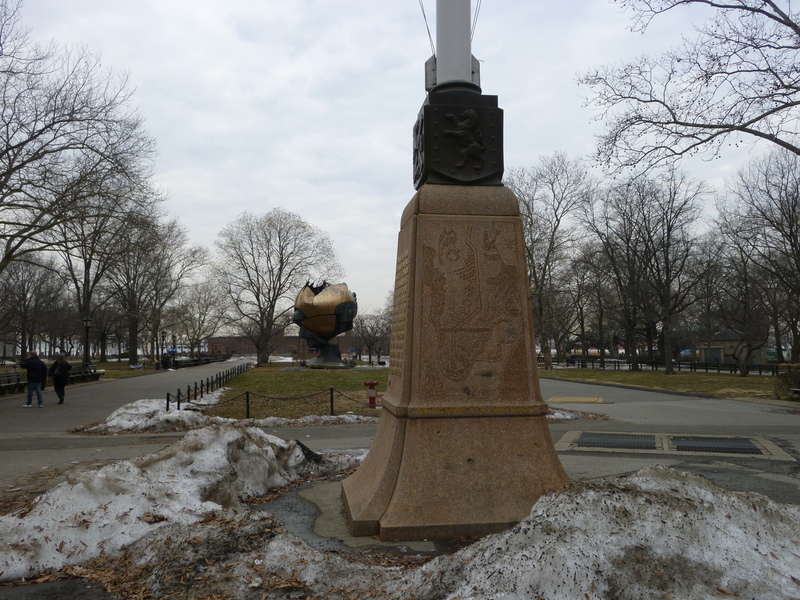 The 1903 John Ericsson Memorial honors the Swedish inventor who designed the Monitor, the first Union ironclad warship. 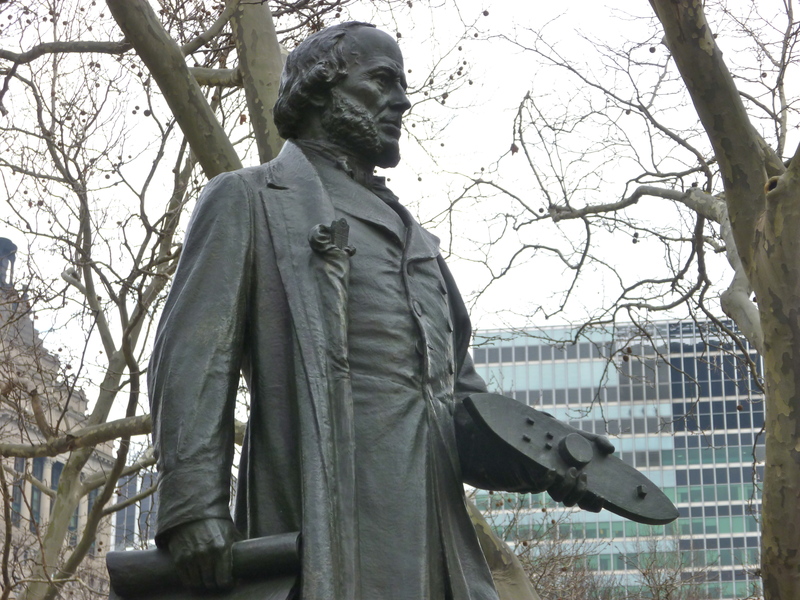 Ericsson, who also invented the screw propeller, is depicted holding a model of the Monitor. 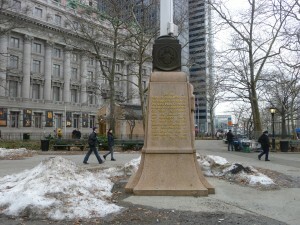 Bronze plaques in the monument’s granite base depict a number of Ericsson’s designs. The statue was created by sculptor Jonathan Scott Hartley, whose other works include three of the nine busts at the Library of Congress’ Jefferson Building. 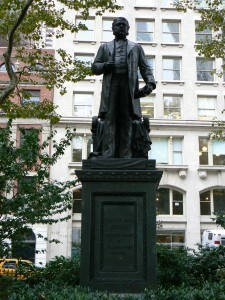 Hartley’s first statue of Ericsson was dedicated in 1893, but Hartley, not satisfied with the original work, created a newer version that was dedicated in 1903. 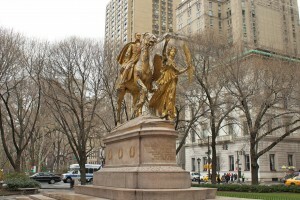 The statue, which carries the 1893 date on its pedestal, was restored in 1996. 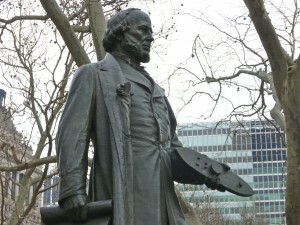 Ericsson is also honored with a bust on the base of a 1906 monument in New Haven honoring shipping and railroad investor Cornelius S. Bushnell, who help finance the development of the Monitor. 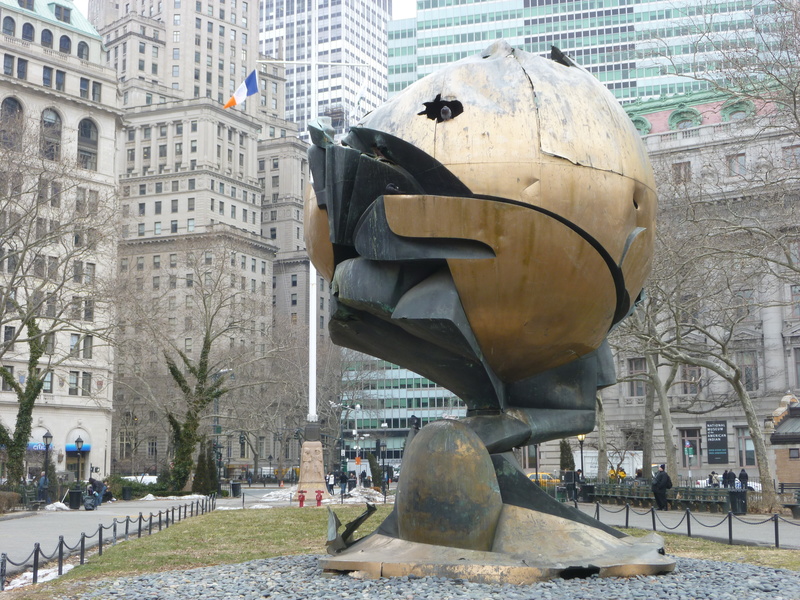 The Sphere and Netherlands Monument, New York, N.Y.
A sculpture damaged in the September 11 attack on New York’s World Trade Center now stands as a temporary memorial to the terrorists’ victims. 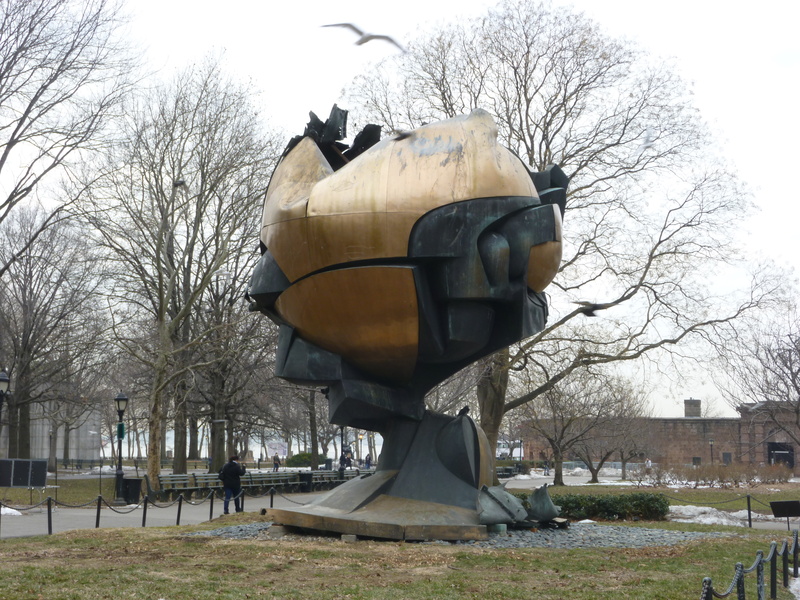 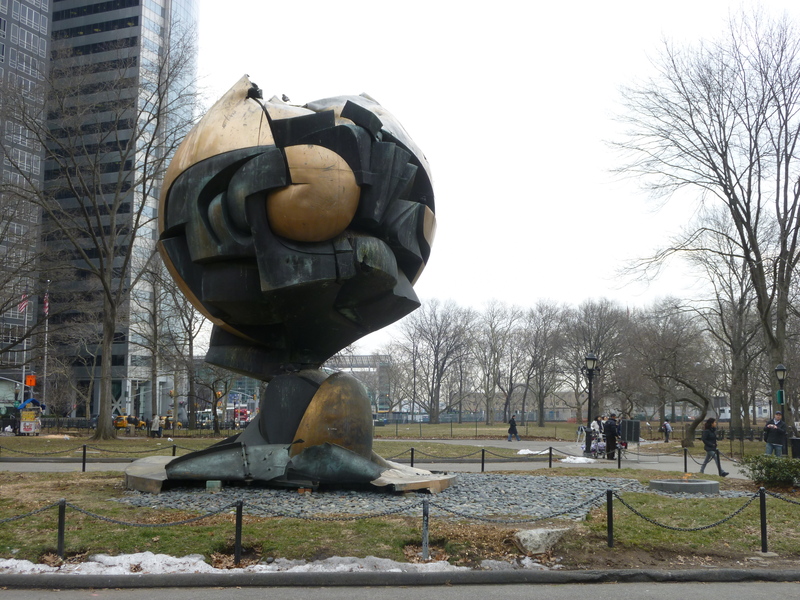 The Sphere, created by German sculptor Fritz Koenig, was moved to Battery Park in March of 2002 and an eternal flame was lit on the one-year anniversary of the Sept. 11, 2001, attacks. 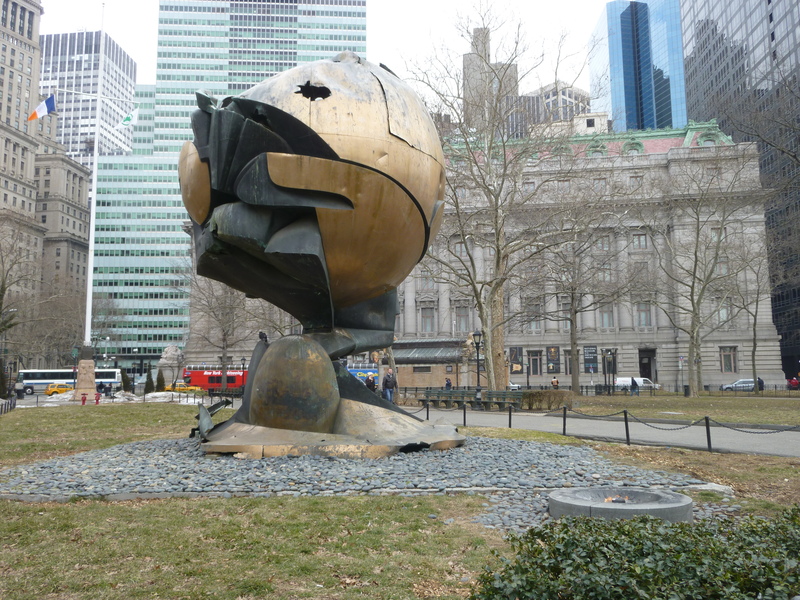 The 25-foot sculpture, originally meant to symbolize world peace through international trade, was first erected in a fountain that stood in the plaza between the trade center’s two towers. 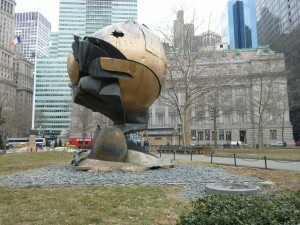 After the attack, the damaged sculpture was recovered from the trade center rubble and placed into storage before it was put on display, with a new base, in the park (a short walk from the trade center site). The Sphere stands almost in the shadow of a flagpole and base, dedicated in 1926, that honors the establishment of the Dutch settlement of New Amsterdam in lower Manhattan. 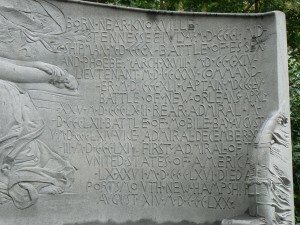 The east face bears an inscription, in Dutch, that we presume matches the English inscription on the west face. The north face bears a bas-relief map of the Dutch colony of New Amsterdam shortly after its founding. 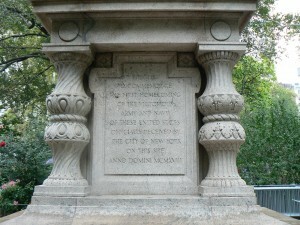 The monument was created by Dutch sculptor H.A. 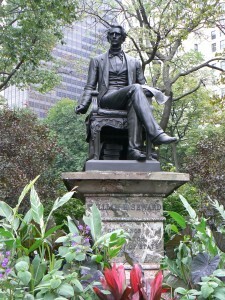 Van den Eyden. The Dutch settlers of New Amsterdam surrendered to British forces in 1664, and New Amsterdam was renamed New York. 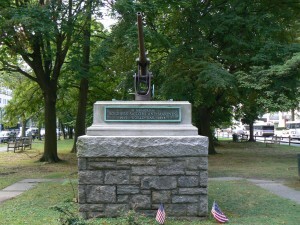 Soldier’s Monument, White Plains, N.Y.
White Plains honors its Civil War veterans with a monument in a downtown park. 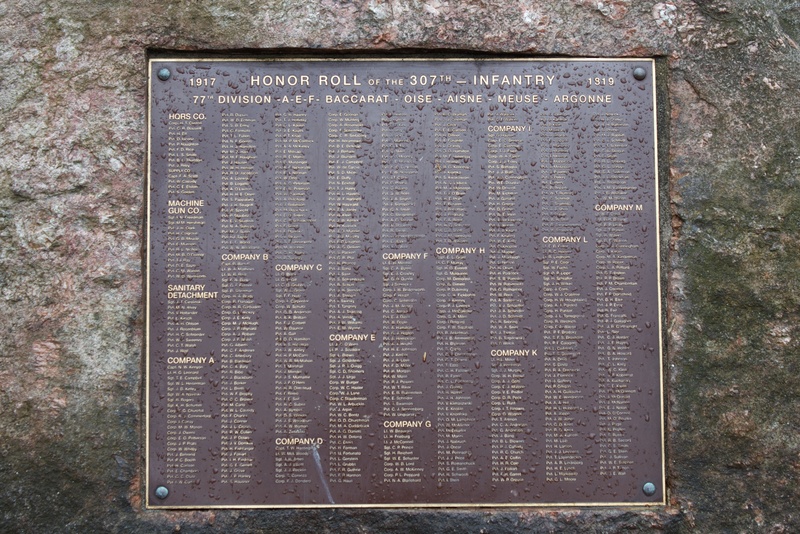 The monument’s north and south faces each list the names of about a dozen residents killed in the conflict. The monument stands in Tibbets Park, near the intersection of Main Street (Route 119) and South Broadway (Route 122). A large cherry tree directly in front of the monument prevents careful exploration and photography. 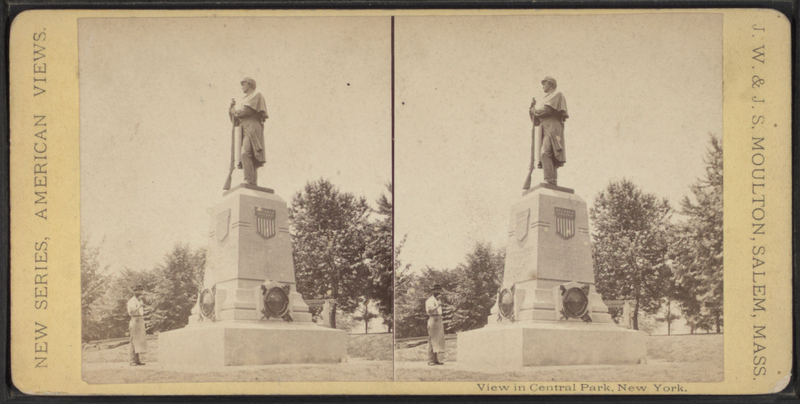 Information about the monument’s sculptor and supplier haven’t come to light, but the White Plains soldier is a copy of a monument that stood on the Civil War monument in Green-Wood Cemetery in Brooklyn, New York. 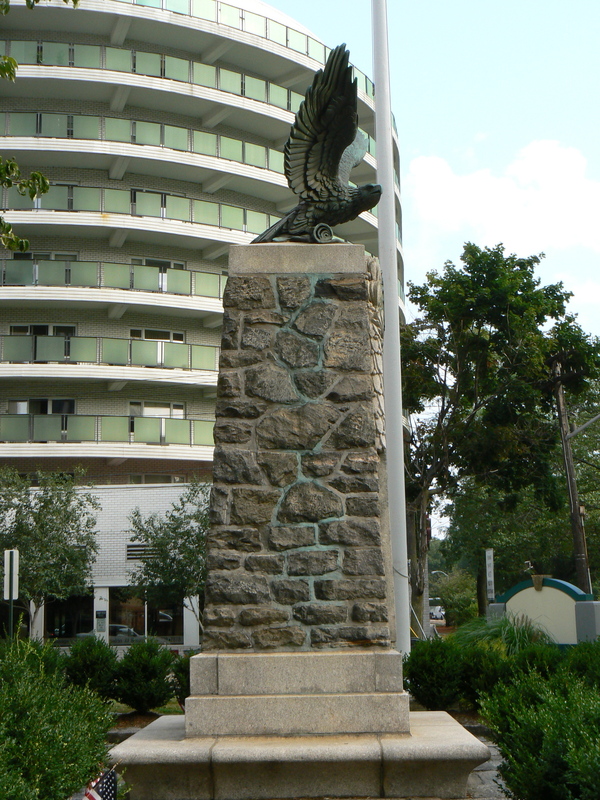 White Plains’ World War I monument stands a short walk north of the Civil War monument. The monument, which features an artillery rifle, bears a simple dedication to soldiers, sailors and marines on its north face. 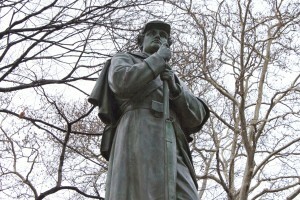 The use of zinc was relatively uncommon in Civil War monuments. 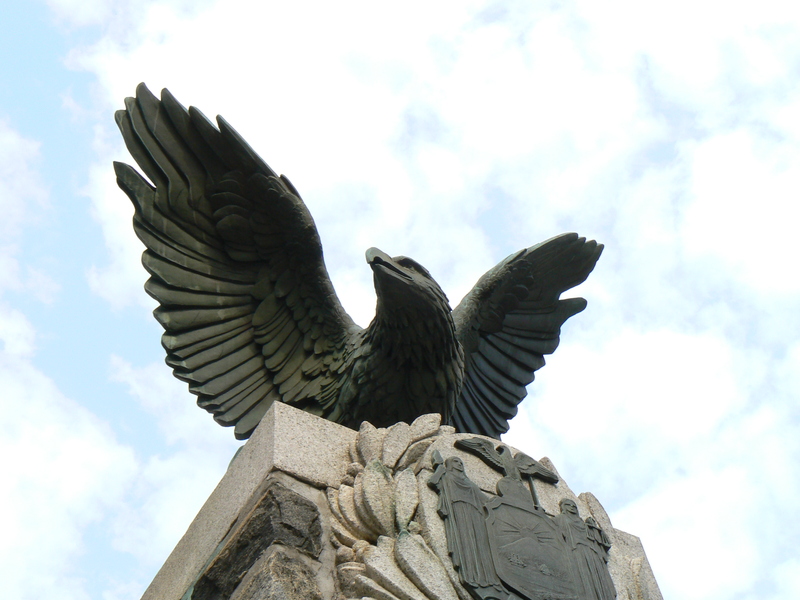 Zinc was marketed as “white bronze” and used, primarily for smaller cemetery monuments, in the late 19th century. 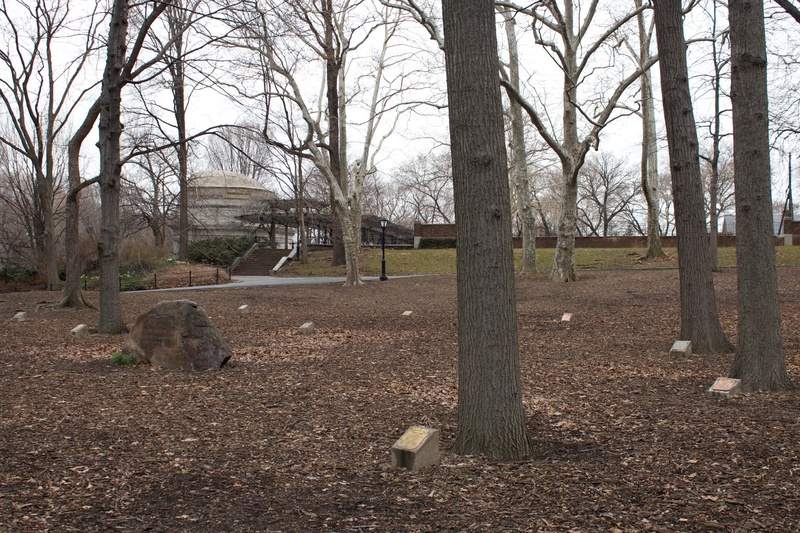 The material resists wearing and fading better than marble or granite, but can become brittle after extended exposure to cold weather. 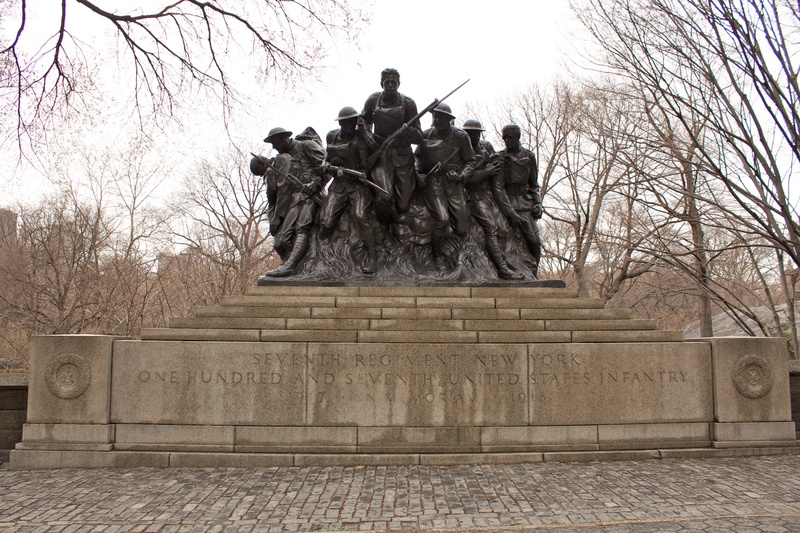 In addition, large zinc monuments often have difficulty supporting their weight, so they often needed later reinforcement with internal steel frameworks. 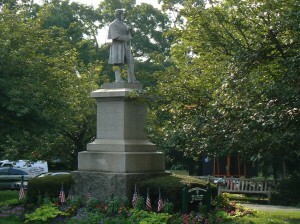 All-zinc monuments can be found in Stratford, Conn., Gettysburg and several other locations. 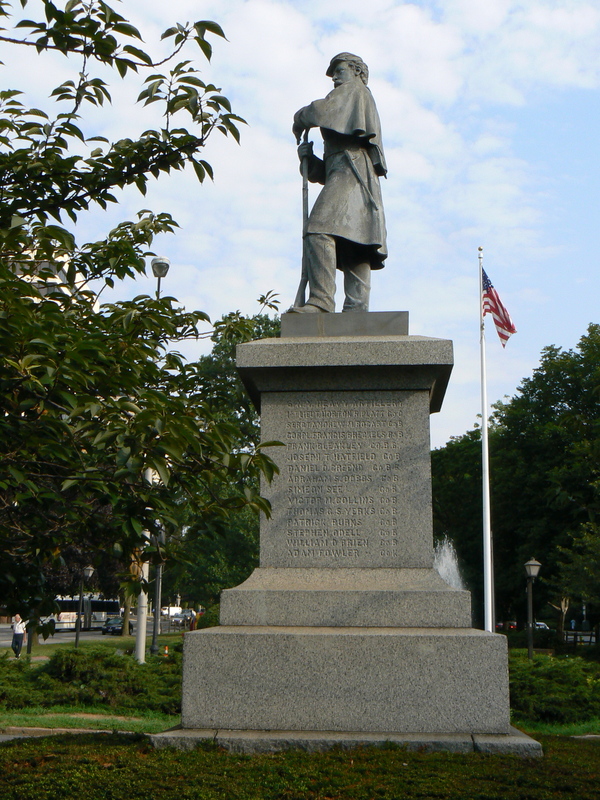 The combination of zinc and granite found in White Plains can also be seen in Orleans, Mass. 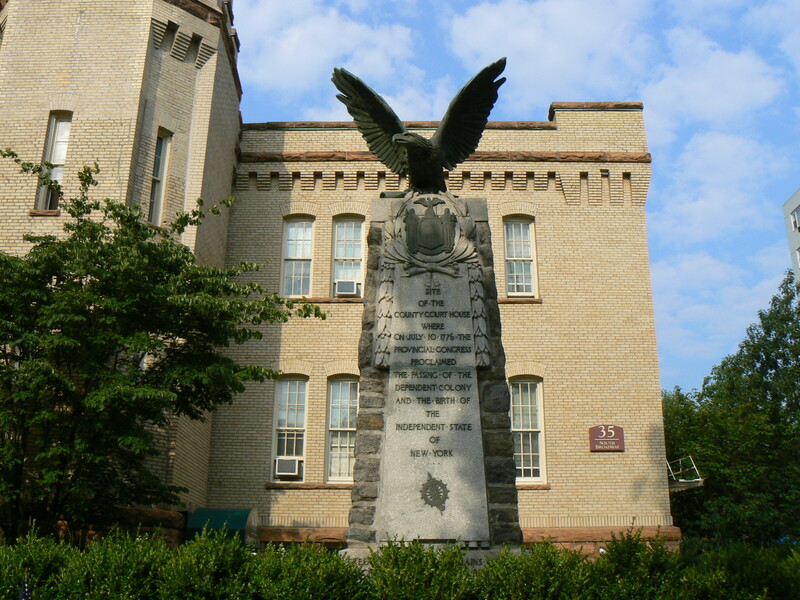 State Birthplace Monument, White Plains, N.Y.
A large monument marking the location of the county courthouse where New York proclaimed its independence stands in front of a former armory in White Plains, New York. The 1910 monument features a large bronze eagle atop granite blocks that served as part of the foundation of the first and second courthouse buildings to stand on the site. 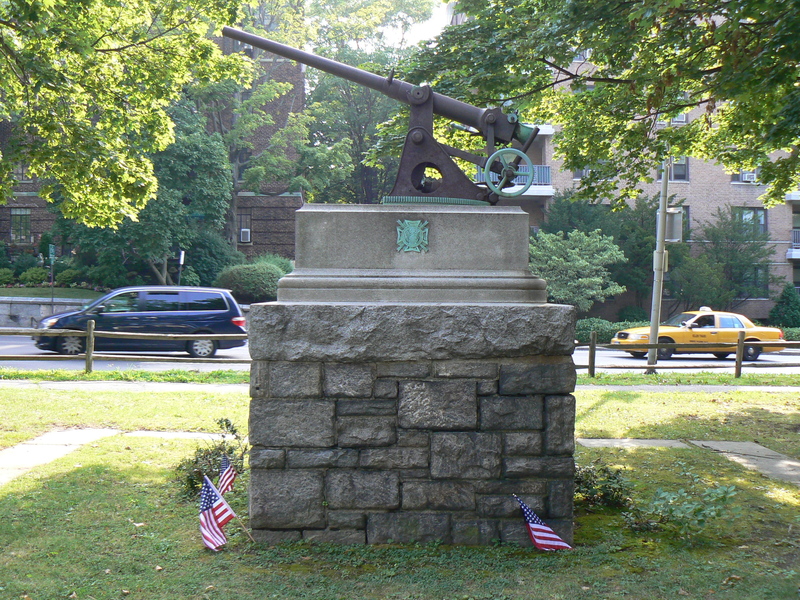 The monument, by sculptor Bruno Louis Zimm, was erected by the Daughters of the American Revolution in conjunction with the construction of a state armory on the site. 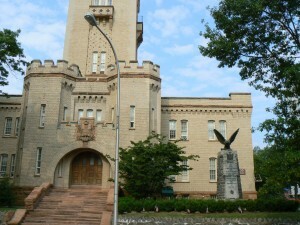 The armory was converted into housing units and a senior center in the late 1980s. The courthouse site, on South Broadway (near the intersection of Mitchell Place), has long been an important landmark for White Plains. 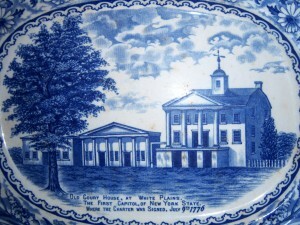 The first courthouse, depicted in a 1910 plate image posted by the White Plains Historical Society, was erected there in 1758. 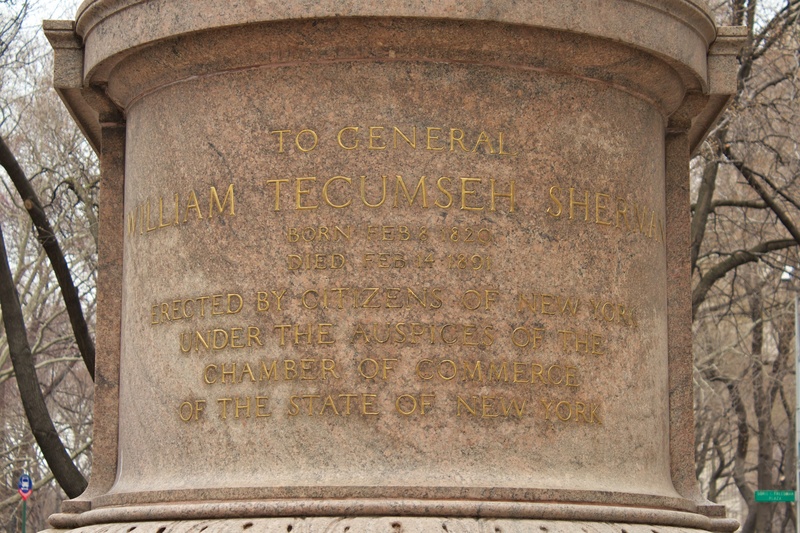 In July of 1776, the charter creating New York State was signed at the courthouse after the state legislature was driven from New York City by British sympathizers. The Declaration of Independence was read at the site on July 11, 1776. 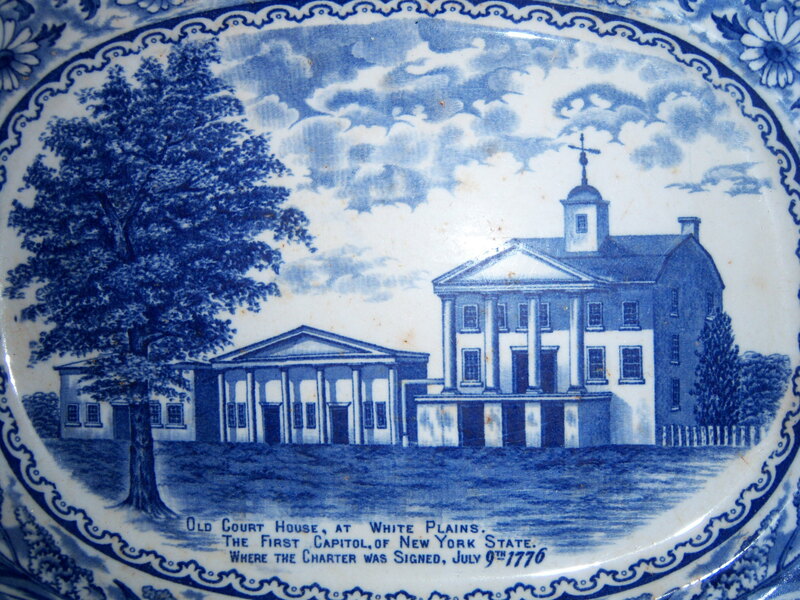 In November of that year, the courthouse was burned by Continental forces following the Battle of White Plains. 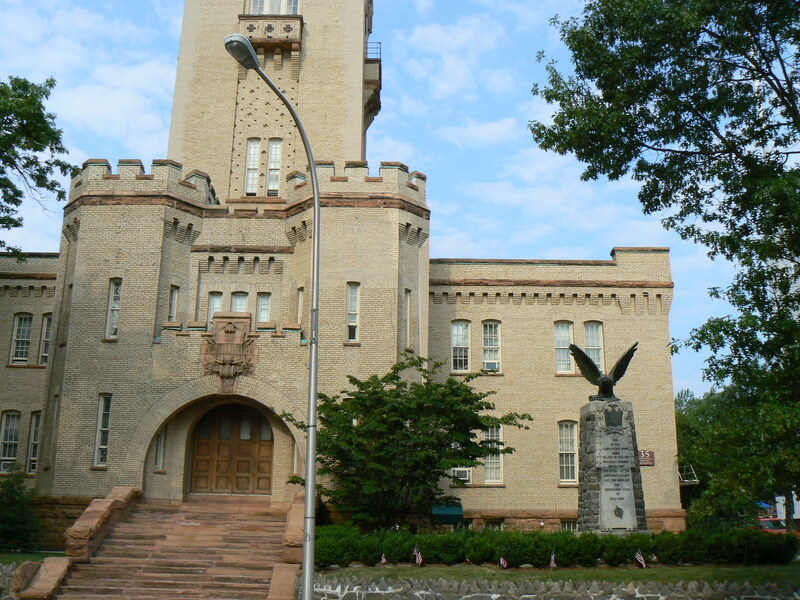 The second courthouse was eventually replaced with a private mansion, and the site was turned over to the state for the armory. 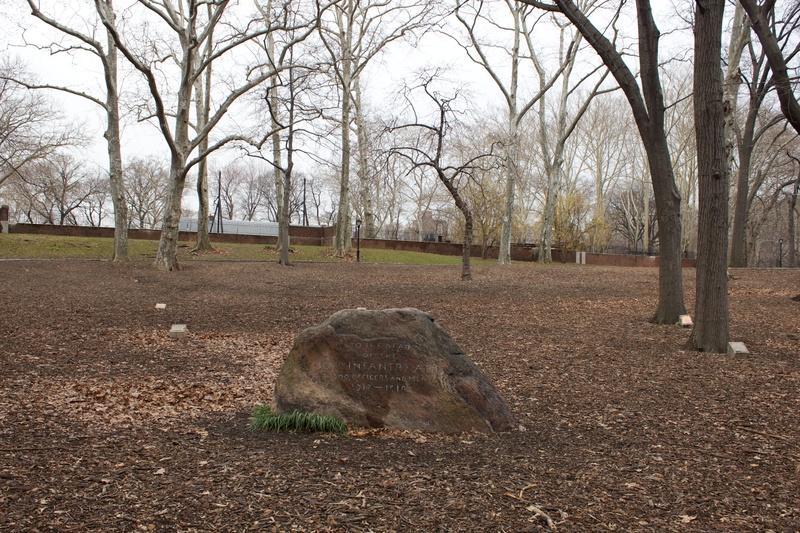 Stones that had been used in the foundations of both courthouses and the mansion today stand as part of the monument and a small plaza leading to it. 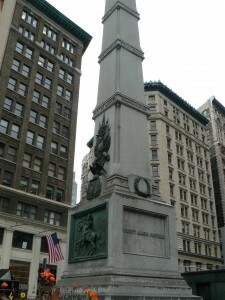 We’ll start our second post looking at the monuments in New York’s Madison Square Park (Part 1 is here) with the Eternal Light Memorial Flagpole on the Fifth Avenue side of the park. 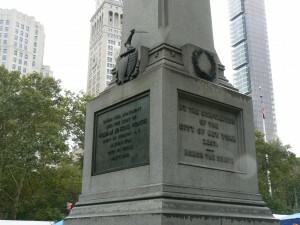 The east face has been inscribed with the conclusion of the national anthem, and the north face bears a dedication “In memory of those who have made the supreme sacrifice for the triumph of the free peoples of the world.” The west face describes the perpetually lit star atop the flagpole as “An eternal light, an inspiration and a promise of enduring peace.” The dedication also provides the November 11, 1923, date of the star’s lighting. 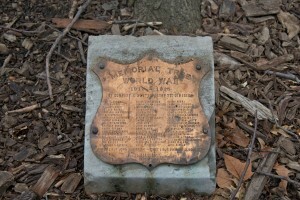 The base is also inscribed with the locations of notable World War I battlefields. 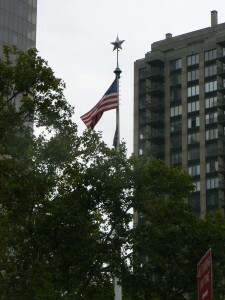 The original wooden flagpole was replaced with an aluminum version in 1976, and the star was restored and relit in 2002. 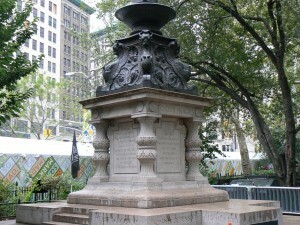 The Eternal Light monument was designed by architect Thomas Hastings, one of the designers of the New York Public Library’s main building. 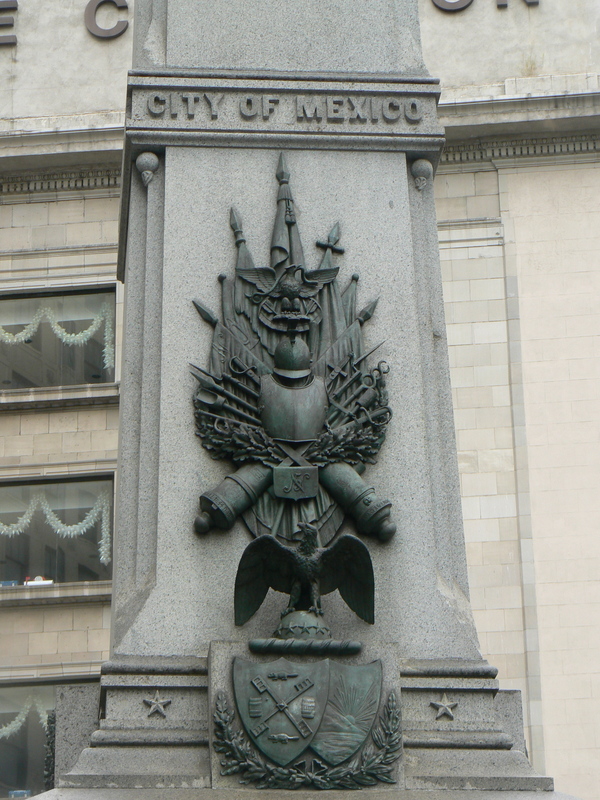 On the other side of Fifth Avenue, a granite obelisk marks the grave of William Jenkins Worth, a Mexican War general who died in 1849 from cholera while commanding military forces in Texas. 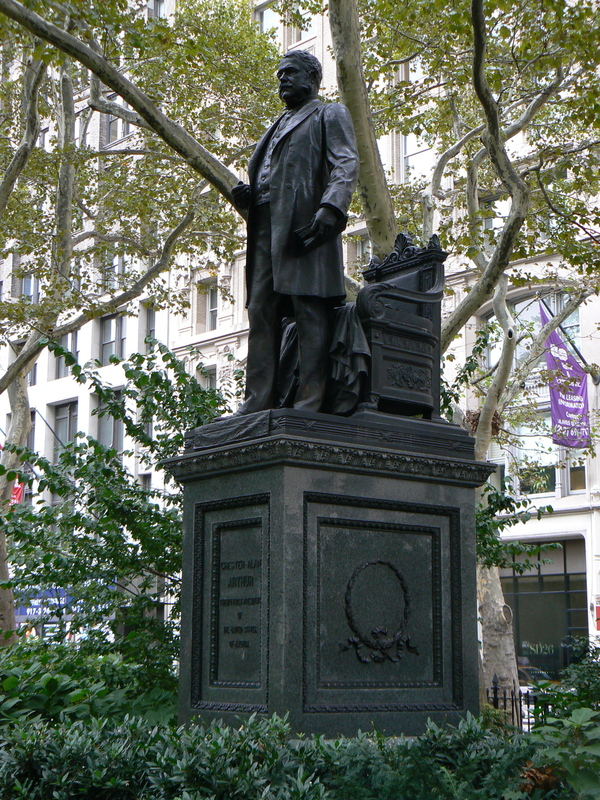 The obelisk, in a plaza known as Worth Square formed by the three-way intersection of Fifth Avenue, Broadway and 23rd Street, was dedicated in 1857. 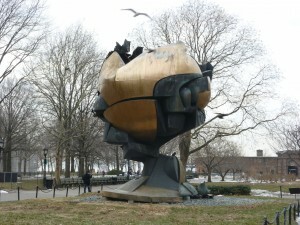 (Worth had been buried temporarily in Brooklyn before being moved to the Manhattan monument.) 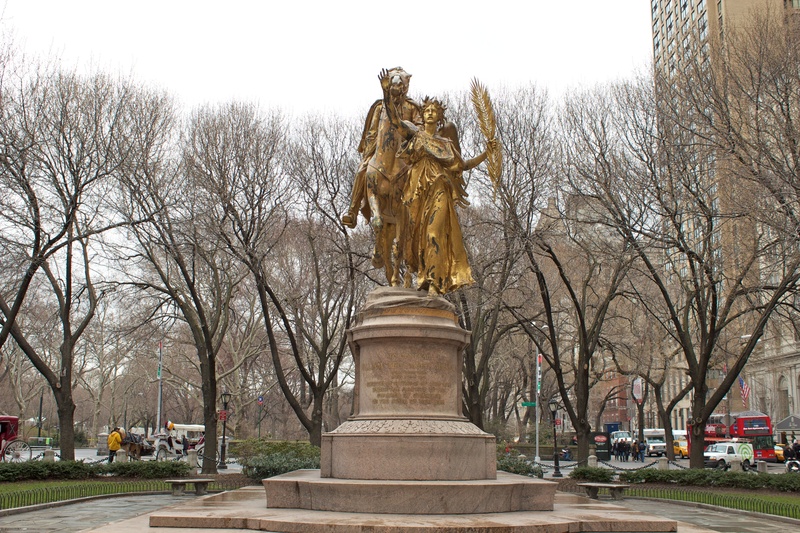 It is the second-oldest monument in Manhattan (an 1856 equestrian statue of George Washington in Times Square is the oldest) and, along with Grant’s Tomb, one of only two monuments in the city holding the remains of the person being honored. The south face of the obelisk features a bas-relief depiction of the general on his horse, and an elaborate trophy with crossed cannons, armor, two eagles, flags and a variety of weapons. 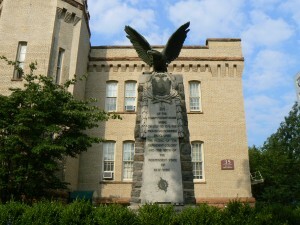 The east face has the Latin inscription “Ducit amor patriae” (Love of country leads (me)). 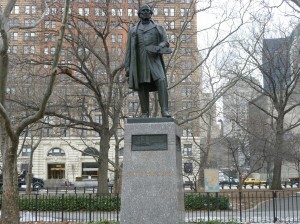 The north face bears a plaque reading, “Under this monument lies the body of William Jenkins Worth, born in Hudson, N.Y., March 1, 1794, died in Texas, May 7, 1849. All four faces of the monument’s shaft list significant battles or postings from Worth’s career. 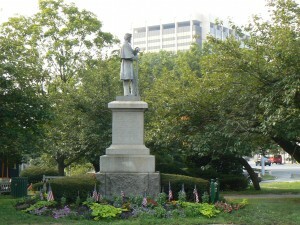 The monument was designed by Hartford’s James Batterson, whose firm supplied a large number of Civil War monuments in Connecticut. 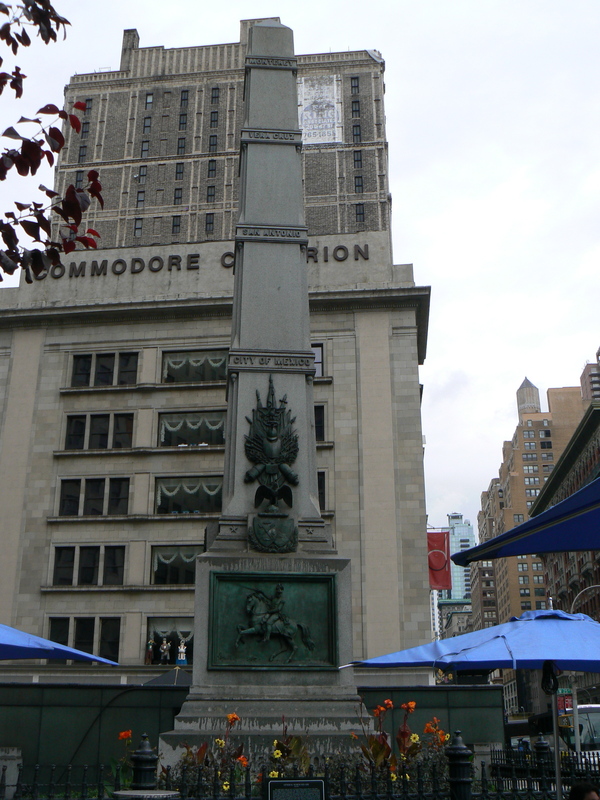 The umbrellas and tables in the plaza in front of the monument are part of a market and food court that runs through November. 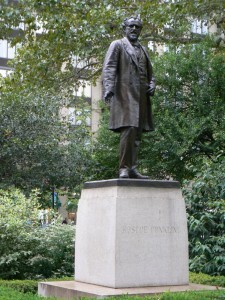 Returning to the northeast corner of Madison Square Park, we find a statue honoring Chester A. Arthur, the 21st president of the United States. 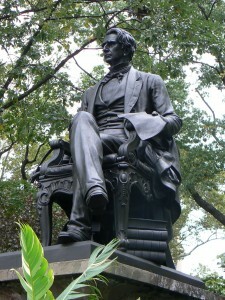 The 1899 monument depicts Arthur standing with his left index finger holding his place in a book. 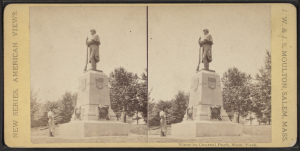 The monument was designed by George Edwin Bissell, who was also responsible for Civil War monuments in Waterbury, Salisbury and other Connecticut municipalities. 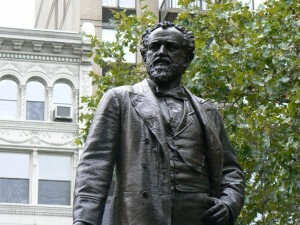 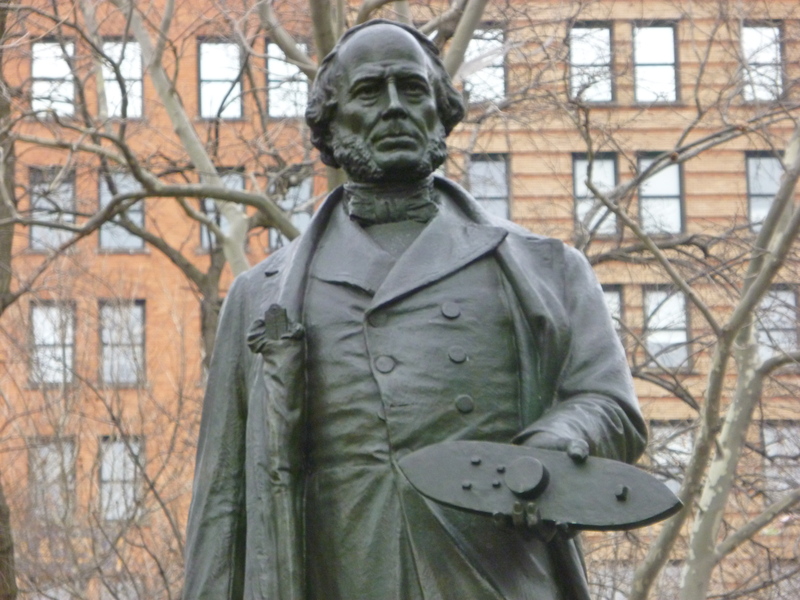 Arthur, a protege of Roscoe Conkling (also honored in Madison Square Park), served as vice president under James Garfield and became president after Garfield’s assassination in 1881. 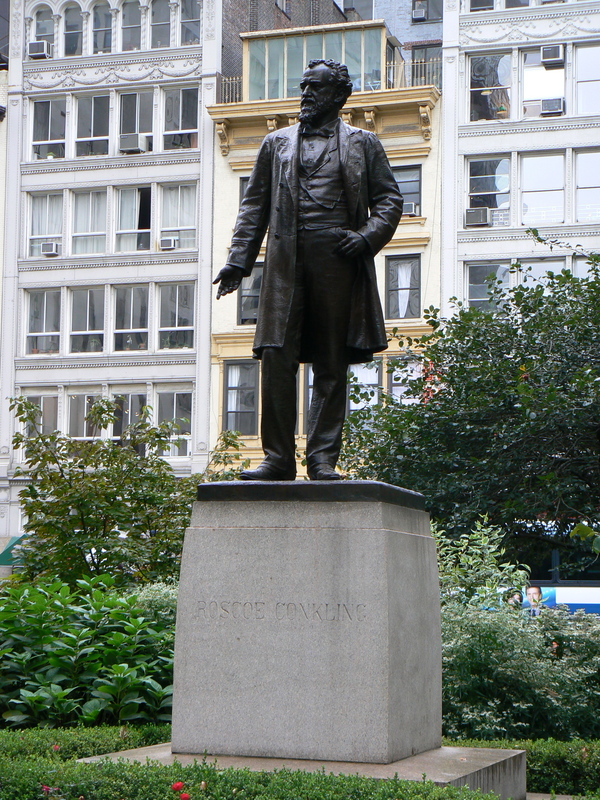 Arthur had split with Conkling over political patronage disagreements, and Arthur’s anti-patronage reforms would help lead to the civil service system. 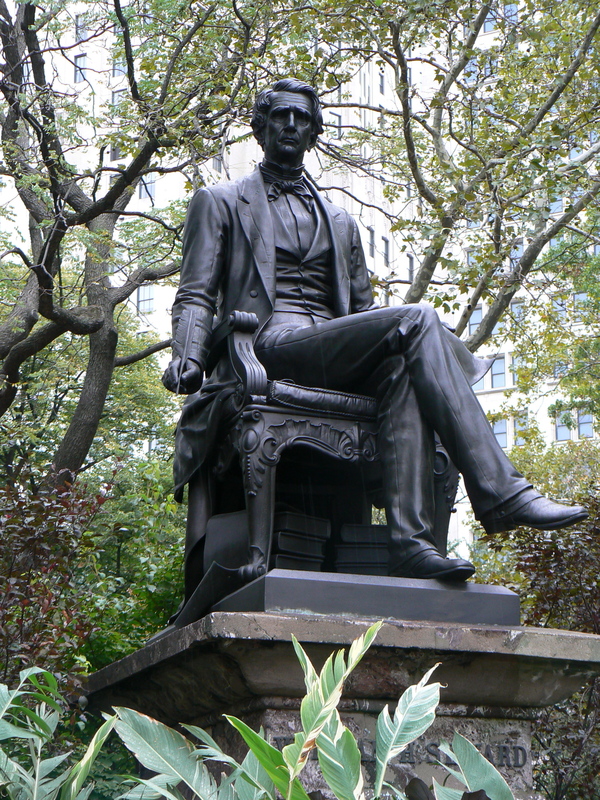 Arthur was a native of northern Vermont, and the fact that his parents owned a farm on the Canadian side of the border led to rumors and speculation that Arthur had been born outside of the United States, and was thus ineligible to serve as president. 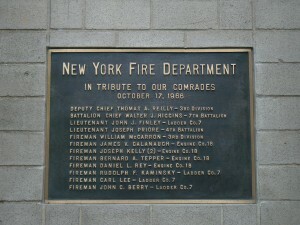 A plaque mounted on the outside wall of a hair salon across 23rd Street from Madison Square Park honors 12 New York firefighters who died in a 1966 drug store fire. 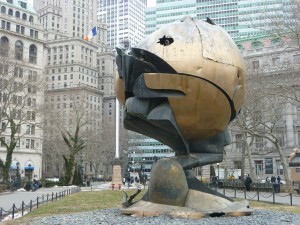 The incident marked the second-largest loss of life for the department, behind only the 9/11 tragedy. New York’s Madison Square Park hosts an impressive collection of monuments honoring residents who served in World War I as well as 19th Century political and military leaders. 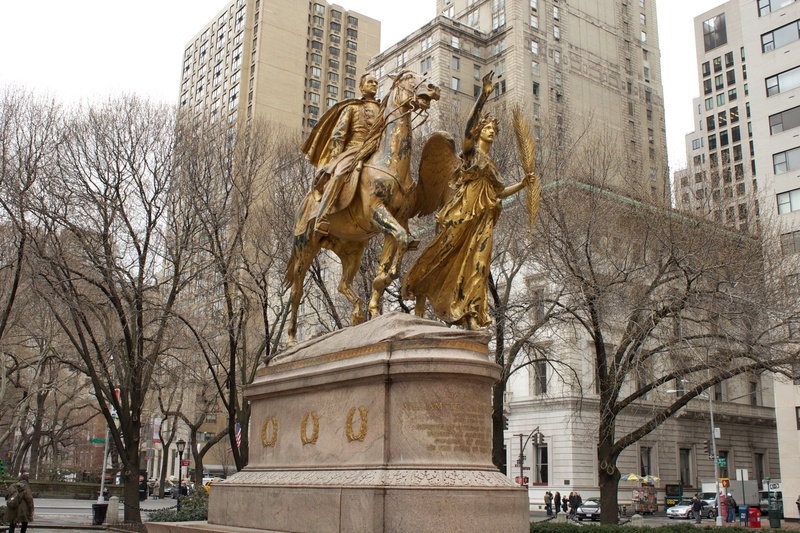 We’re starting the first of two Madison Square Park posts with Augustus Saint-Gaudens’ monument honoring Civil War Admiral David Glasgow Farragut, which is located at the north end of the park. 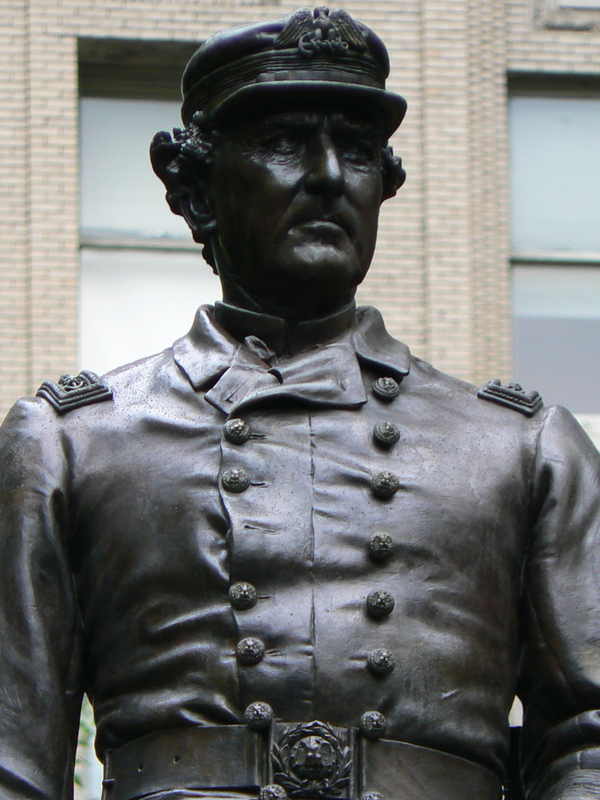 The monument, dedicated in 1881, honors Farragut, a career Navy officer who is probably best known for his “Damn the torpedoes” remarks during the Battle of Mobile Bay. The monument depicts a standing Farragut looking forward with binoculars in his left hand. 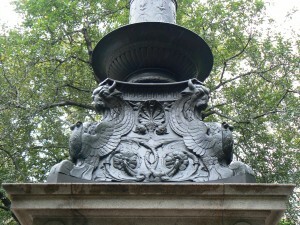 The monument’s base is a 1935 copy of a bluestone pedestal designed by architect Stanford White. 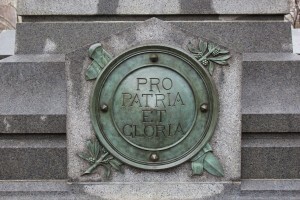 Inscriptions on the two bench wings provide a dedication, in part, to “. 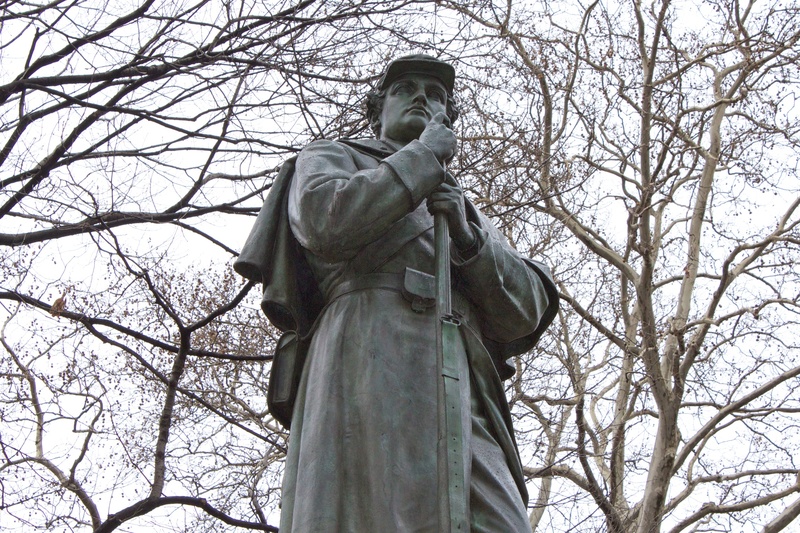 . . the memory of a daring and sagacious commander and great-souled man whose life from childhood was given to his country but who served her supremely in the war for the Union . . .” and biographical details. 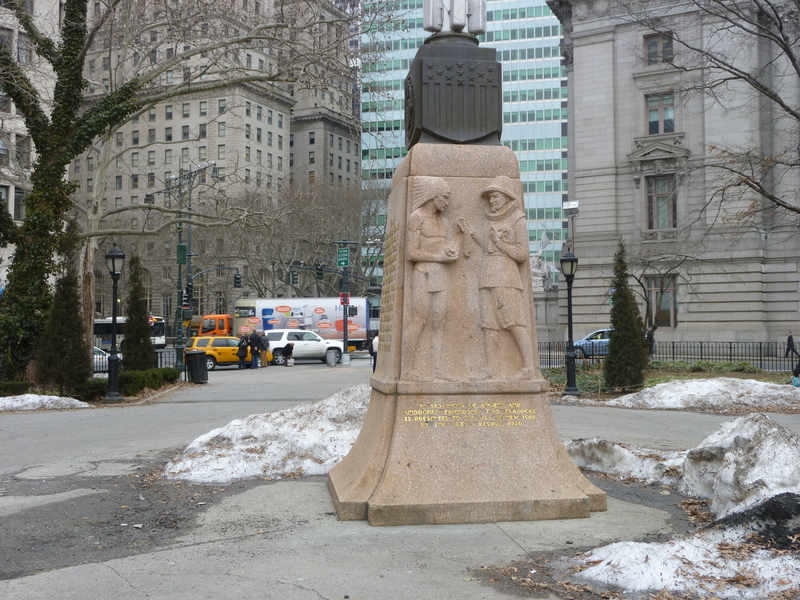 The base was duplicated in 1935 (when the monument was moved from the corner of Fifth Avenue and 26th Street to the park’s interior) because the original had deteriorated. 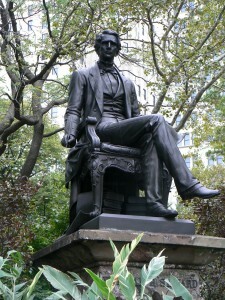 The southwest corner of Madison Square Park features a statue of William Seward, secretary of state for Abraham Lincoln, governor of New York and U.S. senator. Seward, who survived an attempt on his life the night Lincoln was assassinated, is perhaps best known for the 1867 purchase of Alaska from Russia. 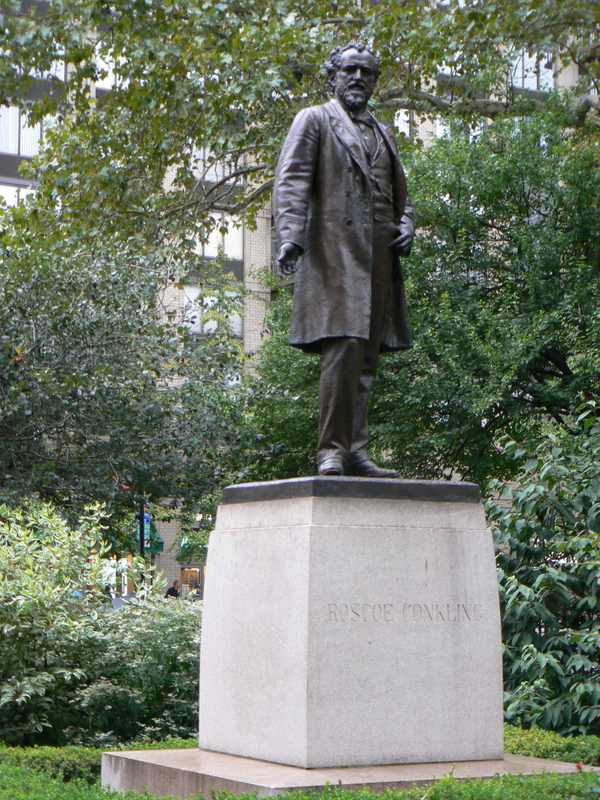 Near the southeast corner of the park is a statue honoring Roscoe Conkling, a Congressman, U.S. 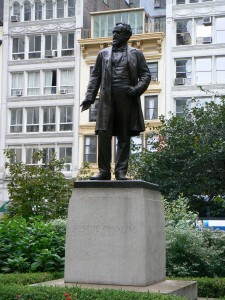 Senator and political boss closely associated with Chester A. Arthur (who is also honored with a statue in the park). 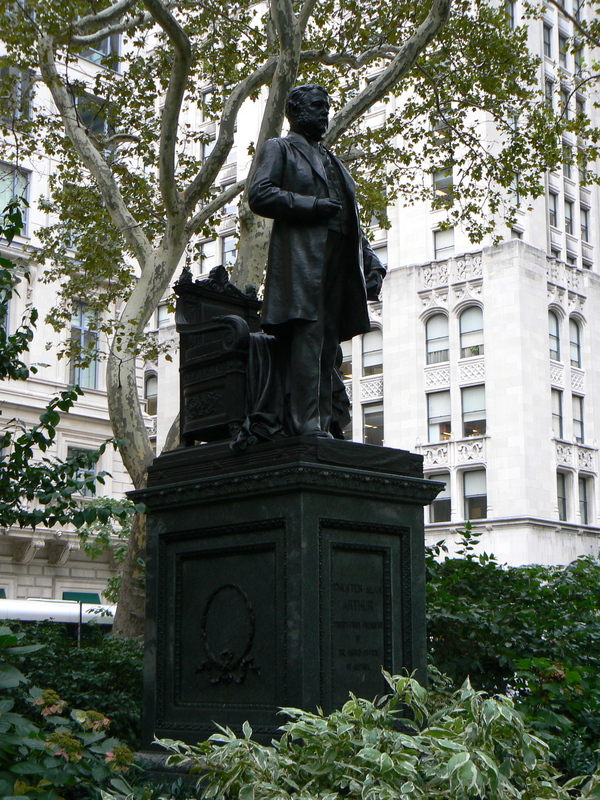 The Conkling statue, dedicated in 1893, was created by sculptor John Quincy Adams Ward. 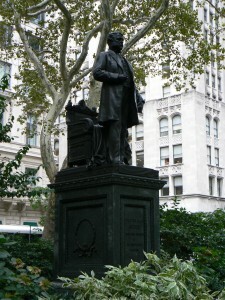 Until a few years ago, the Conkling statue was closer to the corner of the park, and faced southeast toward 23rd Street. 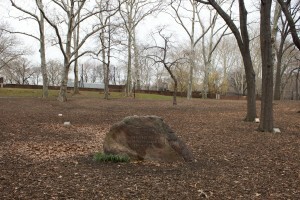 After it was cleaned as part of the park’s recent restoration, it was moved a few yards west and reoriented toward the north. The Madison Square neighborhood, like most in Manhattan, has fallen in and out of favor over the years. 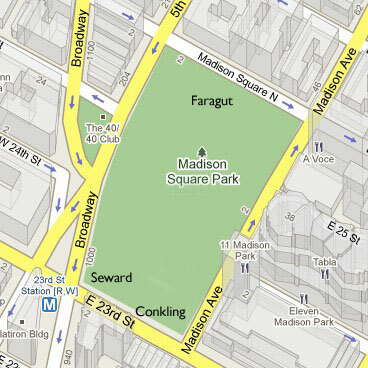 During the 19th Century, it was a fashionable home, restaurant and entertainment district, and the first two versions of the Madison Square Garden sports arena were in the neighborhood. The Statue of Liberty’s torch and arm were displayed in the park for six years as part of fundraising efforts for the statue’s base. Madison Square Park and its monuments have benefitted from an extensive renovation in the late 1990s. 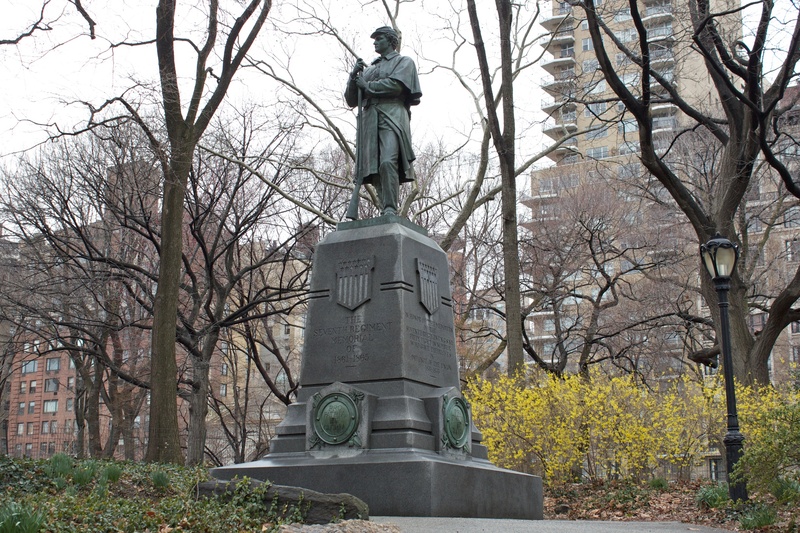 We attended college near the park in the late 1980s, and back then the park’s plantings were sparse, its statues were green and the Farragut monument had spray-painted graffiti. 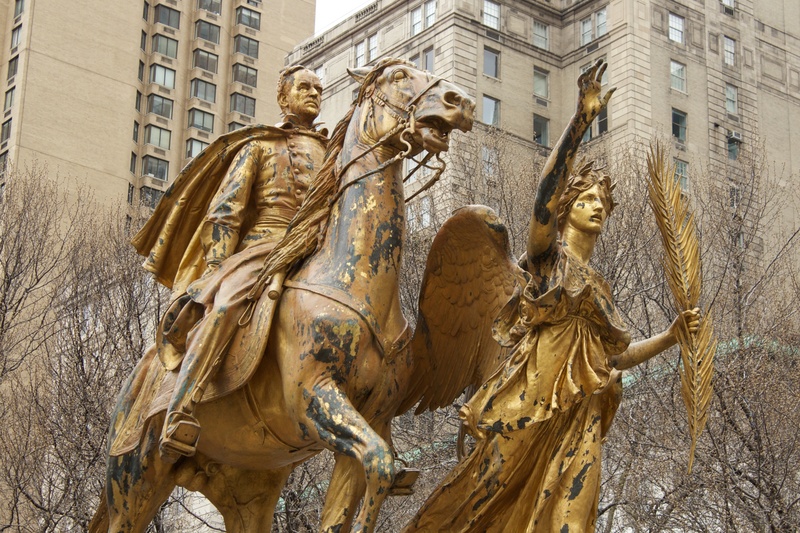 While we generally prefer to see bronze statues acquire a green patina over time, we applaud the other improvements in the park.